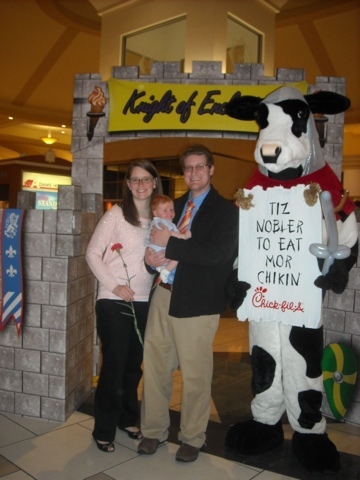 This is a bit overdue, but we finally got the picture of our family from the date "knight" a few months back from Chick-fil-a. I think this was Perry's first experience with a costumed character...and he could not have cared less at the time. We will see how he does as he gets a little older. Thank you Chick-fil-a for being so family friendly and hosting special events for your customers. We are finally getting a Chick-fil-a near our house in Hampton Cove in June. It can not be built fast enough!